With the grace of Allah today we are going through the twenty second day of fasting and are in the third ashra (ten days) of Ramadan. According to a saying of the Holy Prophet (peace and blessings of Allah be on him) we have passed Ramadan’s ten days of God’s mercy and then ten days of God’s forgiveness and are now going through ten days of salvation from the fire of Hell. It is God’s favour on us that He has granted us the opportunity to experience this. However, a true believer has firm belief in God, tries to abide by righteousness and is filled with fear of God and is not merely joyous that the last ten days of Ramadan will be a source of his salvation. No doubt, these days of Ramadan are a source of mercy, forgiveness and salvation from the fire of Hell, but have we truly availed their beneficence? Their beneficence cannot be garnered without abiding by the commandments of God and His Prophet (peace and blessings of Allah be on him). Indeed beneficence of these days has its requisites which we need to look out for in order to please God and attain His grace. Indeed, God is Gracious but when man violates His law and is guilty of chastisement God’s attribute of justice comes into play. Generally God’s mercy encompasses everything but in places violation of Divine law requires punishment, yet God can have mercy and forgive. Such a situation is not becoming for a Muslim. A true believer has special status and his belief demands to keep his spiritual state in check and abide by God’s commandments to the best of his abilities. However, if owing to human frailties he happens to commit sin, God’s mercy covers him. Such a situation would be different to the one explained in an earlier sermon where one is brazen in committing sin on the pretext that God’s mercy is very extensive. This is tantamount to challenging God’s wrath. Indeed, God saves and forgives the guilty owing to their repentance even those guilty for whom chastisement has been decreed can be forgiveness due to their humble entreaties. This is not a place a true believer should be at, that is, violate Divine law and then make entreaties and look for Divine mercy. The second kind of mercy is related to true believers, mercy which is conditional to good deeds as stated: ‘…Surely, the mercy of Allah is nigh unto those who do good.’(7:57). [The Arabic word used here for those who do good is mohsin] Mohsin محسن is one who is good to others, who abides by righteousness, has knowledge and fulfils God’s work with all its requisites. God’s mercy is for those who do not commit sin deliberately, who always call unto God and remember Him and fear committing sin. If they unknowingly commit some sin they call onto God with righteousness in heart and this is what attracts God’s mercy and their prayers are accepted. It is indeed God’s special grace that He accepts our prayers. God’s mercy is with the mohsin who spends a righteous life and who is good to others and fulfils their rights. Man does not come in the category of being a mohsin by doing ordinary good acts. This demands that one’s practices are of very high standard. The Holy Prophet (peace and blessings of Allah be on him) defined mohsin in a way that gives rise to great cause for concern. He said a mohsin is a person who when doing anything good is conscious that he is watching God or at least that God is watching him. If one is conscious of this at all times one would simply not do any wrong and will not go astray from righteousness. In fact one could not even imagine harming anyone. Commandments of Islam are such that no matter how one practices them they end up comprising of paying rights of God and paying rights of mankind. Although we wish that our prayers are accepted and we receive God’s mercy but vast majority of us do not regularly make the efforts which a true believer needs to make in order to attain the status. We are delighted to experience the first ten days of Ramadan which are days of mercy but do we also stop and ponder if we practiced during the days what we should have practiced to seek God’s mercy? Did we make short-term entreaties like a sinner or did we try to mould our life abiding by righteousness like those mohsins who make Ramadan a true source of bringing enduring pious changes in themselves? The Holy Prophet (peace and blessings of Allah be on him) gave a treasure of a modus operandi for life in this word ‘mercy’. He told us to seek this mercy in the first ten days of Ramadan and having sought it promise to make it an enduring part of our life. However, since Satan is ever on the outlook to lead people astray, once we have attained God’s mercy, in order to stay firm we need help. What is it that we need to do regarding this? Spend the next/following ten days of Ramadan seeking help and power from God and that power is of Istighfar (seeking forgiveness from God). A true believer makes God’s quality of covering faults and His mercy a part of his life, both in terms of worship of God as well as his practices. This results in Divine forgiveness wrapping and covering him and further doors to Divine mercy opening up. Drawing attention to Divine mercy during Ramadan signifies that God’s favours and grace specifically come into play during this month and during the ten days of mercy His special beneficence which is specific to forgiveness is dispensed. During this time one should seek power to do good and seek light from God’s light so that one does not turn to darkness again. Man is inherently weak and thus in order to safeguard against this weak state and to take power from God’s power, Istighfar is necessary. Attention is drawn to the Divine attribute of All-Sustaining because in order to establish something, like piety, one needs God’s help. God is Ever-Living and All-Sustaining and the most powerful support that there is. The middle ten days of Ramadan do not merely signify to do as much Istighfar as possible in order to attain the objective. 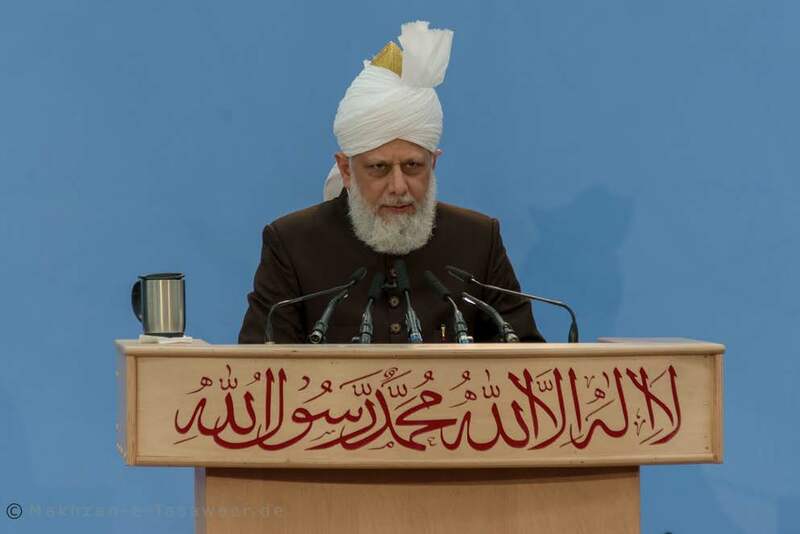 The Holy Prophet (on whom be peace) drew our attention that when Ramadan comes, God comes closer to creation and we are greatly focussed on prayers. Therefore, in order to seek enduring measure of His forgiveness we engage in Istighfar to come in God’s refuge. May it be so that vast majority of us spent our Ramadan in this manner and have now entered the last ten days with the view to make the light and power we have attained take us onto attain God’s pleasure! The Holy Prophet (peace and blessings of Allah be on him) told us that the last ten days of Ramadan are salvation from the fire of Hell. Once a person comes under Divine forgiveness, attains light and power from God, obviously he will be closer to God. God does not leave anyone without a reward. When man tries to do good for the sake of God, God does not simply save him from the fire of hell. By calling the last ten days of Ramadan days of salvation from the fire of hell the Holy Prophet (peace and blessings of Allah be on him) in fact told us that God also gives glad-tidings of Paradise to those who fulfil the requisites. If we repent sincerely and seek Divine forgiveness and try and stay firm on virtues, the worship of the thirty days of Ramadan, fulfilment of rights and constant practice of repenting and Istighfar will permanently close the doors to Hell on us. We should understand the fine point that salvation from Hell and attainment of Paradise begins in this world. With true connection with God, repentance and Istighfar one can experience paradise in this world greater rewards of which will be granted in the Hereafter. And not seeking true connection with God, His love, mercy and forgiveness at all times is deliberate violation of God’s commandments. The Islamic concept of Heaven and Hell is not limited to the Hereafter. There is also heaven and hell in this world. As the hadith of the Holy Prophet (peace and blessings of Allah be on him) explained if we think that we can see God or that God is seeing us at all times, it will stop us from going astray. Those who do wrong are always in fear of being caught and this in itself puts them in a hellish state. One who fears God attains paradise in this world and the Hereafter and one who is embroiled in evil selfish and base desires is embroiled in hell in this world and the Hereafter. Being faithful and sincere to God is paradise in itself and being distant from His commandments is hell in itself. This hadith mentions three things and draws our attention to God’s mercy, to engage in Istighfar to stay firm and that once these are attained one’s every word and deed is for God. Enduring beneficence of Ramadan becomes a part of his life and he attains God’s Paradise in this world and the Hereafter. In order to attain God’s pleasure and to secure one’s faith, there is another aspect to the last ten days of Ramadan about which the Holy Prophet (peace and blessings of Allah be on him) gave us glad-tiding and that is Lailatul Qadr (The Night of Decree). The Holy Prophet (peace and blessings of Allah be on him) said that the past sins of a person who fasts during Ramadan in a state of belief and while holding himself to account are forgiven. And the past sins of a person who experiences Lailatul Qadr in a state of belief and while holding himself to account are also forgiven. Lailatul Qadr has great significance but other days of Ramadan also hold similar significance. What is important are the factors of state of belief and holding oneself to account. If there were any inadequacies in the early days of Ramadan, efforts should be made in latter days to make good those shortcomings. The Holy Prophet (peace and blessings of Allah be on him) did not say sins will be forgiven of one who experiences Lailatul Qadr, rather he held it conditional to being in a state of belief and while holding oneself to account. Belief has been tied with good works and we should always keep this in view. One of the many signs of true believers in the Holy Qur’an is: ‘Truebelievers are only those whose hearts tremble when the name of Allah is mentioned, and when His Signs are recited to them they increase their faith, and who put their trust in their Lord,’ (8:3). When our attention is repeatedly drawn to good works and paying dues of others with reference to God, we should keep them in view. When man is asked to fulfil these rights with reference to God but does not pay attention then, does man come under the classification of true believers in accordance with this verse? It is stated that if everyone fasts during Ramadan while holding themselves to account and experience Lailatul Qadr, then their sins are forgiven. Blessings of Ramadan and Lailatul Qadr are conditional just as commandments of God and His Messenger are conditional. For example, if a person has weak faith and usurps others but says he experienced Lailatul Qadr then either God granted him exceptional grace which demands that he stays firm on what is right and abides by commandments of God and if not then what he thought was Lailatul Qadr may be a figment of his imagination. Explaining this point, the Promised Messiah (on whom be peace) has said that Lailatul Qadr is not only a specific night that falls during Ramadan. It has three forms: a night during Ramadan, time of a Prophet of God and Lailatul Qadr of an individual is also when he is purified and has firm faith and rids himself of all evil while holding himself accountable. If this Lailatul Qadr is experienced and we become sincerely God’s, abide by His commandments and elevate our standards of worship we have found the objective which is commanded by God. Following this each day and each night becomes an hour of acceptance of prayer. 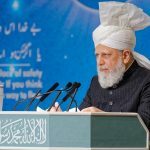 We, the followers of the true and ardent devotee of the Holy Prophet, the Promised Messiah need to bring about a revolutionary change in ourselves and elevate our state of faith to the level where our each word and deed is to attain pleasure of God and where we spend our lives holding ourselves accountable. May the blessings of Ramadan always remain with us! May Allah make many of us experience the Lailatul Qadr which is a special instance of acceptance of prayer and about which the Holy Prophet (peace and blessings of Allah be on him) told us that it befalls one night during last days of Ramadan. May experiencing it keep us on piety and righteousness and enhance us. May all our past sins be forgiven and may with His grace God grant us special power to avoid sin in future!